Now the clocks have gone back and the nights are a lot darker earlier I've been thinking more and more about Christmas. Infact you know its nearing Christmas when all the adverts on the television have a link to Christmas or they are all toy adverts. Talking about adverts, the one I love near Christmas time is the John Lewis advert, last years was a heart warmer. I wonder what this years will be like? Anyway, as I think more about Christmas I keep thinking about what to get Jack. I find it so difficult to buy presents for everyone and Jack is no exception. With his birthday only being 2 months later I find I need to spread gifts out, whilst trying not to get the same as everyone else. I took myself over to the John Lewis website, the home of Christmas, and took a look at their range of toys they have. I feel they have a great range of toys, especially of baby and preschool toys, perfect for Jack. 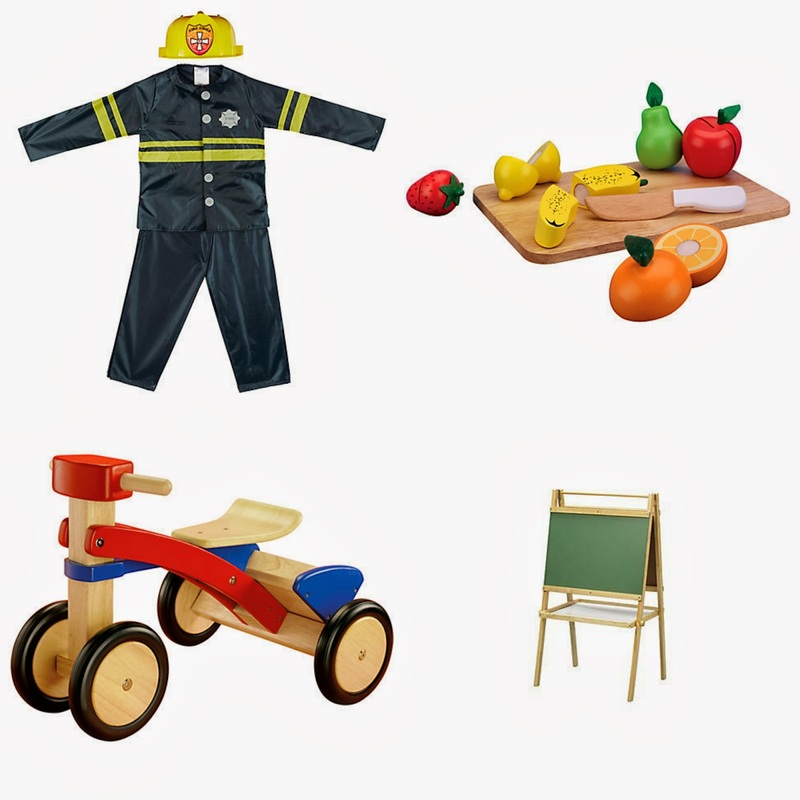 There is such a great range of toys for all ages upon the website you will definitely be able to find something. Whilst browsing I have found these four toys which I shall be adding to my list to purchase for Jack, aren't they adorable? So included is a Fireman Dressing Up Costume, priced at £15, Jack loves dressing up lately so this would be perfect. A wooden fruit set again priced at £15. Jack adores his fruit so learning to 'chop' them would be great. There is then a wooden trike priced at £45, Jack loves his ride on toys, however he needs something a bit longer lasting now so this would be perfect. Finally there is a double sided blackboard priced at £50. I think this is the item we most need as Jack has begun showing his artistic style on the walls, so this would help with this. So what are you thinking about buying your mini people for Christmas? Brought to you in association with John Lewis.